Next weekend I'll be making a Lemon Confit Shortbread for my mother's 57th birthday. I found the recipe last year in the NY Times. 1. For crust, combine flour, salt, butter and 1 cup of sugar in a bowl. Mix with your fingers until it forms flaky crumbs and lumps. Mix in egg, almond extract and lemon juice. Continue to mix until it clumps; at first it may seem very dry. Shape into a ball, wrap in plastic, and refrigerate for at least 30 minutes, up to 1 day ahead of baking. 2. For confit, slice off and discard ends of lemons. Slice 5 crosswise, peel and all, as thinly as possible. Remove any seeds and place in a bowl. Peel skin, including white pith, from remaining 3 lemons, then slice thinly crosswise, and add to bowl. Add 3/4 cup sugar and 2 tablespoons water. Toss and let sit at room temperature for at least 30 minutes or up to 2 hours. 3. 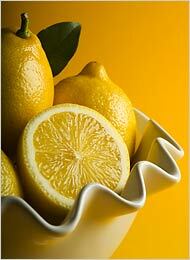 Place lemon slices and their juice in a saucepan, and bring to a boil. Cook down until lemons are candied and small amount of liquid in pan is sticky and syrupy, about 15 minutes. Transfer to a bowl and let cool. 4. To bake, preheat oven to 350 degrees. Divide dough in half and form each half into a ball. Roll one ball until large enough to fit into a 9-inch round tart pan. Dough will be crumbly (more shortbread than pie crust); if it falls apart, press it back together. Spoon confit over crust, spreading evenly. Roll out second ball of dough and place on top, sealing edges but making sure no crust overlaps the rim (or tart will be difficult to remove later). 5. 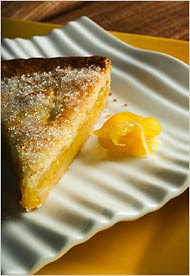 Bake until edges of tart are lightly golden, about 35 minutes, then sprinkle top with remaining 1/4 cup sugar. Return to oven for about 10 more minutes; edges should be lightly golden and crust cooked through but not browned. Serve warm or cooled. I'm not a huge lemon-dessert person so I think I might make a side of coconut milk whipped cream for the side. 1. Place the can of coconut milk in the refrigerator and leave it there until well-chilled; I left mine in overnight. 2. Open the can of coconut milk. There will be a firm, waxy layer on top. 3. 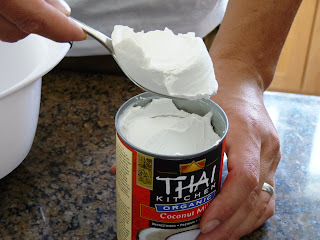 Scoop out this firm layer coconut cream that has solidified at the top of the can. 5. Place this cream in the bowl of a stand mixer, or a large bowl. 6. Turn your mixer or hand beaters to high speed, and whip the coconut cream for 3 to 5 minutes. 7. Whip until it becomes fluffy and light, with soft peaks. Mix in sugar or vanilla, if using.